Moira Foot (born 19 June 1953 in Northampton) is an English actress. She is perhaps best remembered for the nine episodes of 'Allo 'Allo! in which she played Denise Laroque, the leader of the local communist resistance. She also played Miss Thorpe, Mr. Rumbold's temporary secretary, in three episodes of Are You Being Served?. Other series in which she appeared include Hark at Barker, Six Dates with Barker, His Lordship Entertains, On the Buses, Oh Happy Band!, Maggie and Her, Doctor at Large, Quiller, and The Benny Hill Show. In 1977 she appeared in the episode Angels of Death in The New Avengers. Her film credits include roles in One Brief Summer (1970), On the Buses (1971), and The Strange Case of the End of Civilization as We Know It (1977). Moira Foot Autograph - Allo Allo! 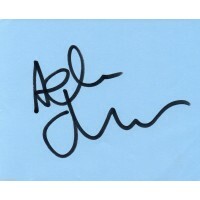 - Signed 10x8 Photo - Handsigned - AFTALMoira Foot (born 19 June 1953 in Northampton) is an English actress. She is ..
Ken Morley Autograph - Allo Allo! - Signed 10x8 Photo 2 - Handsigned - AFTALKen Morley (born 17 January 1943) is an English actor and comedian. 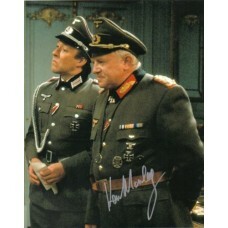 He is ..
Ken Morley Autograph - Allo Allo! 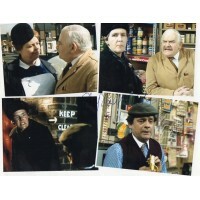 - Signed 10x8 Photo 4 - Handsigned - AFTALKen Morley (born 17 January 1943) is an English actor and comedian. 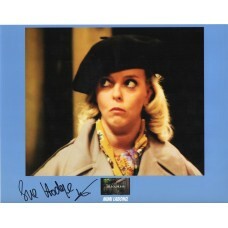 He is ..
Sue Hodge Autograph - Allo Allo! - Signed 10x8 Photo 1 - Handsigned - AFTALSue Hodge (born 4 June 1957 in Orsett, Essex) is an English actress, best k..
Sue Hodge Autograph - Allo Allo! - Signed 10x8 Photo 2 - Handsigned - AFTALSue Hodge (born 4 June 1957 in Orsett, Essex) is an English actress, best k..